The Spanish editions of TEC's buyer’s guides explore key features and selection criteria for enterprise resource planning (ERP) and business intelligence (BI) software suites and outline how the right software can transform organizations. 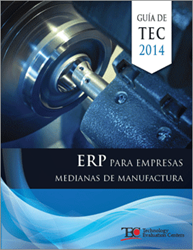 TEC's Software Buyer's Guides are now available in Spanish for Business Intelligence (BI) and ERP software. Over the years, Technology Evaluation Centers (TEC) has seen its Spanish-speaking community of IT and business professionals steadily increase its research activity regarding enterprise software evaluation and selection. To better support this growing market, TEC has published two of its software buyer’s guides in Spanish to help organizations in the Latin American and Spanish markets gain insight into software market trends and technology, so they can make more informed decisions when selecting essential software solutions such as enterprise resource planning (ERP) and business intelligence (BI) software suites. TEC buyer’s guides are globally recognized in the IT industry for their comprehensive and impartial research and analysis of essential enterprise software functionality and the solutions available on the market. These informative enterprise software guides are developed by the company’s independent software research analysts, who keep tabs on market trends and analyze several leading software solutions provide objective guidance for the software buyer. Each buyer’s guide presents the findings of the TEC research analyst, key selection factors and features of leading software solutions, and case studies from the software provider community. Selecting the right software to meet an organization’s needs can be a daunting task. TEC facilitates the software evaluation and selection processes, helping companies make better enterprise software decisions—and saving them time and money by doing the legwork and identifying the critical decision factors upfront. The Spanish edition of the TEC ERP Software Buyer's Guide for Midsize Manufacturers explores ERP technology trends, outlines the software functionality that is critical for a midsize manufacturer, and summarizes the features of leading solutions that support the Latin American and Spanish markets. It also includes a special report on the pros and cons of using a cloud ERP solution, which is an important decision for a midsize organization in any market to make. The Spanish edition of the TEC Mobile BI Buyer’s Guide surveys the market to help decision makers understand the BI and analytics solutions available for mobile platforms, provides an overview of the main features and functions of mobile BI solutions, and outlines how with the right BI solution an organization can transform the way it does business. As the world’s leading online provider of software selection tools, services, and research materials, Technology Evaluation Centers (TEC) helps companies and organizations evaluate and select the best enterprise software for their needs. With its software selection expertise and advanced decision-making software, TEC also helps reduce the time, cost, and risk associated with enterprise software selection. Today, TEC is recognized as an industry-leading software selection advisory firm with more than 400,000 subscribers to its information services and software evaluation and selection tools. For more information, please visit http://www.technologyevaluation.com.